Ronda, might be small but it has loads to offer! 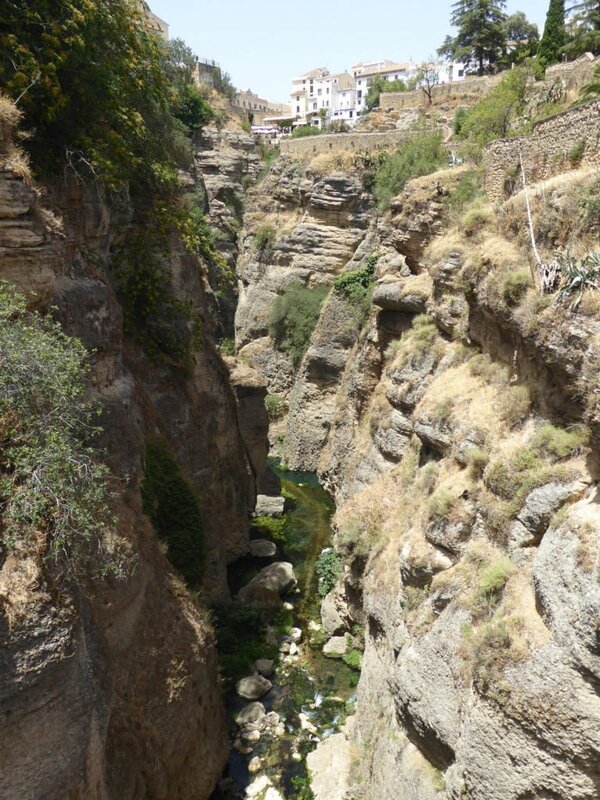 A train journey taking just under 2 hours from Cordoba and you arrive in the small town of Ronda. Ronda, simply put, is a beautiful little town. I decided to go to Ronda because a recommendation and liked the pictures I saw but other than that I didn’t know anything about it or that it even existed. I can see the attraction to the town and why it is a must go to place if you are even remotely near or in the region. 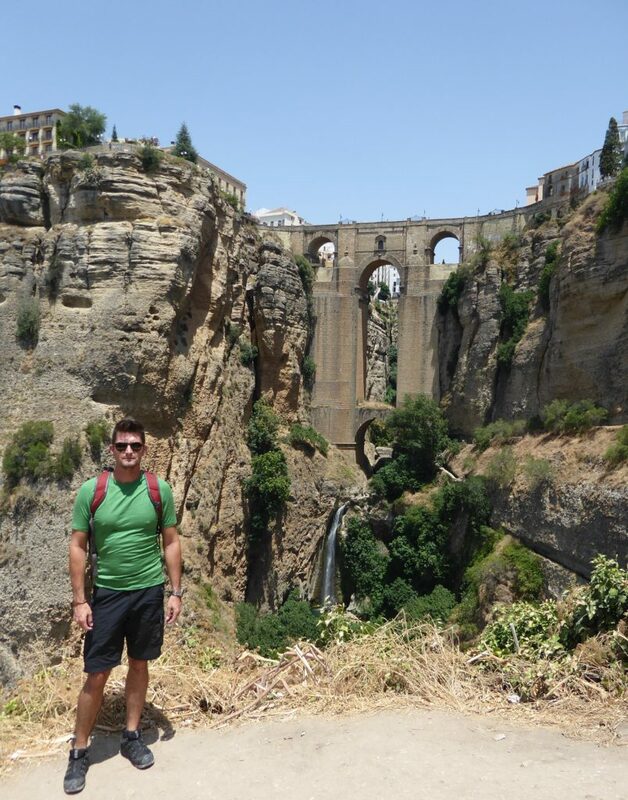 My time in Ronda didn’t go to plan because it turned out to far exceed my expectations! 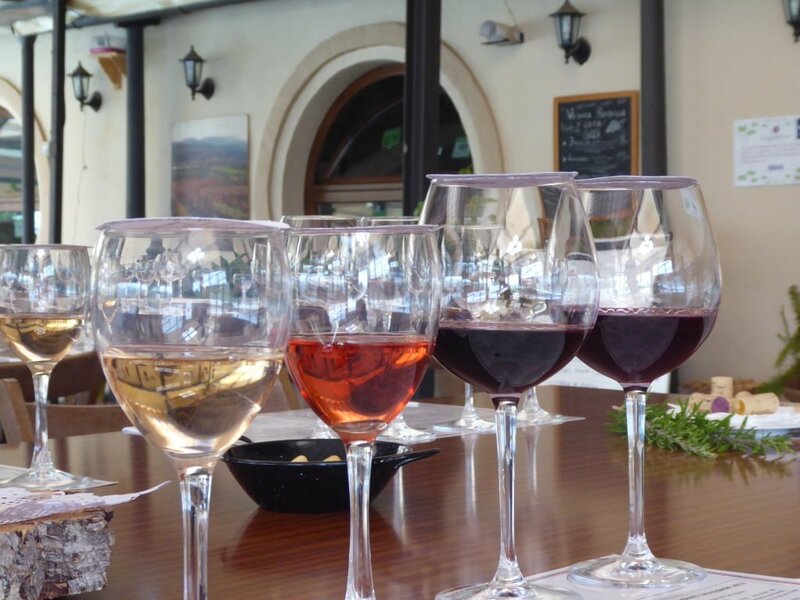 From the scenery, food, wine and the region as a whole, I thoroughly enjoyed my time here and would definitely come back. 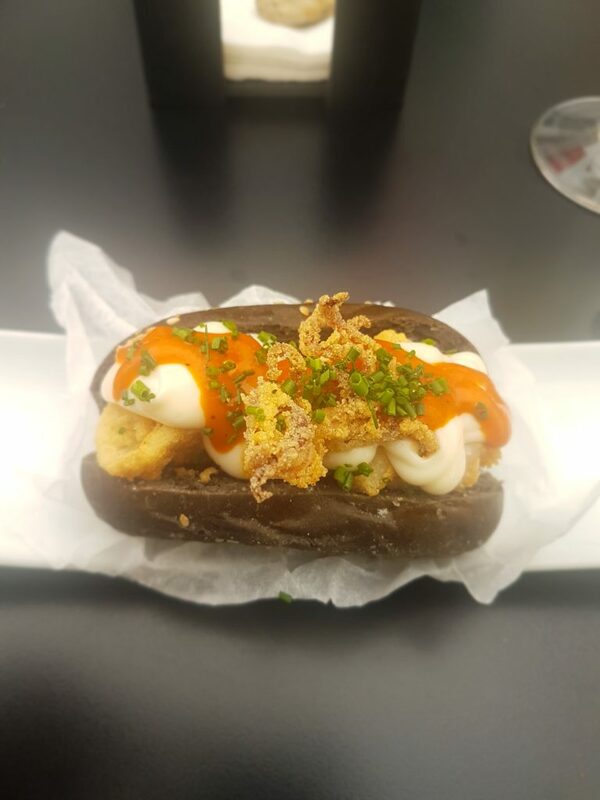 I’ve had a challenging time with the food in Spain, everyone I spoke to always raved about the food, I’ve had tapas many times before, yes, it’s nice but nothing to rave about. 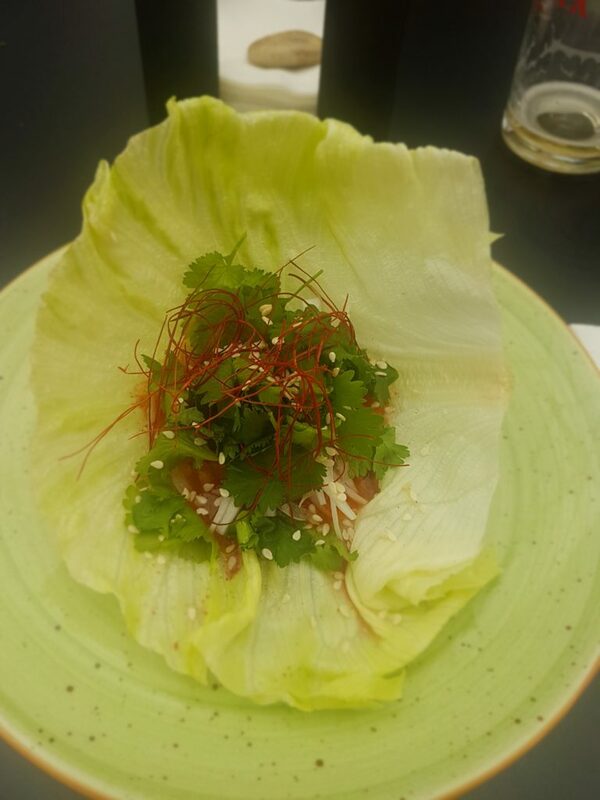 To some degree I think what has happened is that there are so many restaurants it is impossible to try them all, and how do you know which ones to try. Using my standard approach of looking for restaurants the locals use has helped to find nice food but nothing to write home about. From a recommendation, I downloaded an app “Loved Tapas” and it transformed my eating to a brilliant experience! My favourite little restaurant/bar was Tragata; down a little pedestrian road tucked between many other restaurants is Tragata, with their little black sign on green tiles isn’t much to look at but their food is awesome, service is warmly welcoming and friendly and the prices are excellent, very cheap in my opinion. 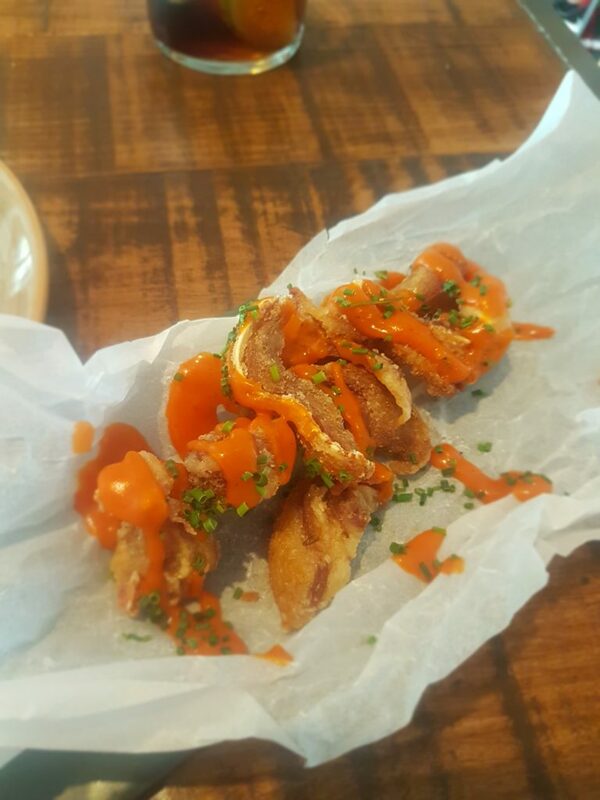 I liked their food so much I went back several times and tasted all their tapas and I would go back tomorrow to have them all again…..well not in one sitting. I am converted, thank you Tragata and Loved Tapas (www.lovedtapas.com). Ah yes! I’m in Ronda! 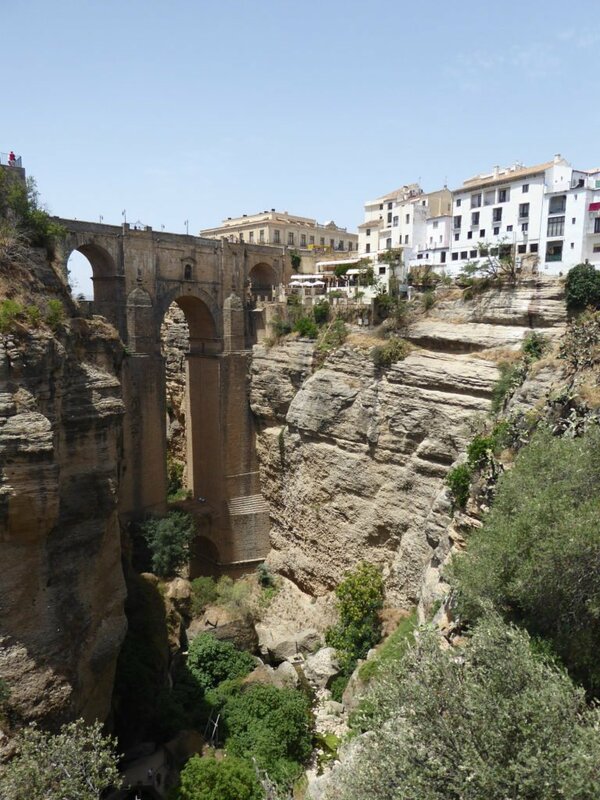 It was very hot during my time in Ronda, average was about 36 degrees and we hit 43 degrees on the day I went wine tasting at three wine estates – a little more about that later. 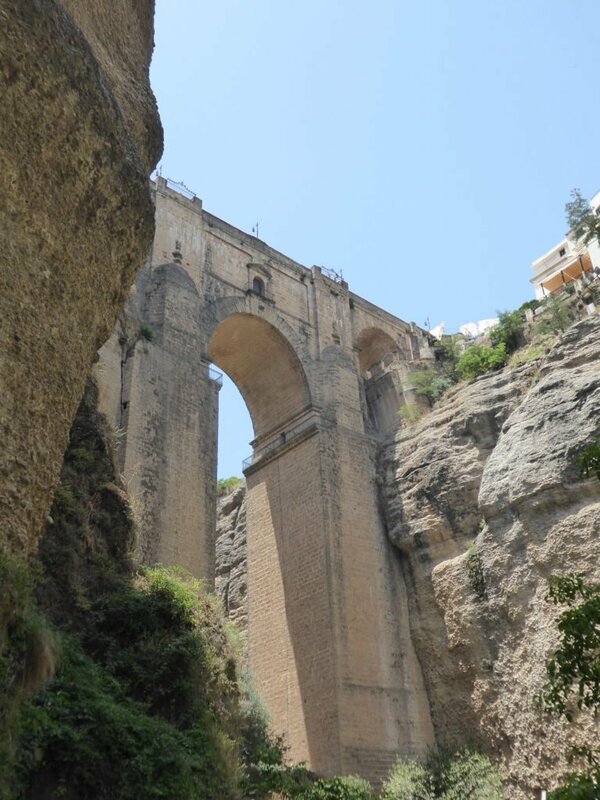 Ronda, perched on what I can only describe as two escarpments joined by a triple arched bridge 98 metres high and 66 metres long which was opened in 1793 (Puente Nuevo/New Bridge). 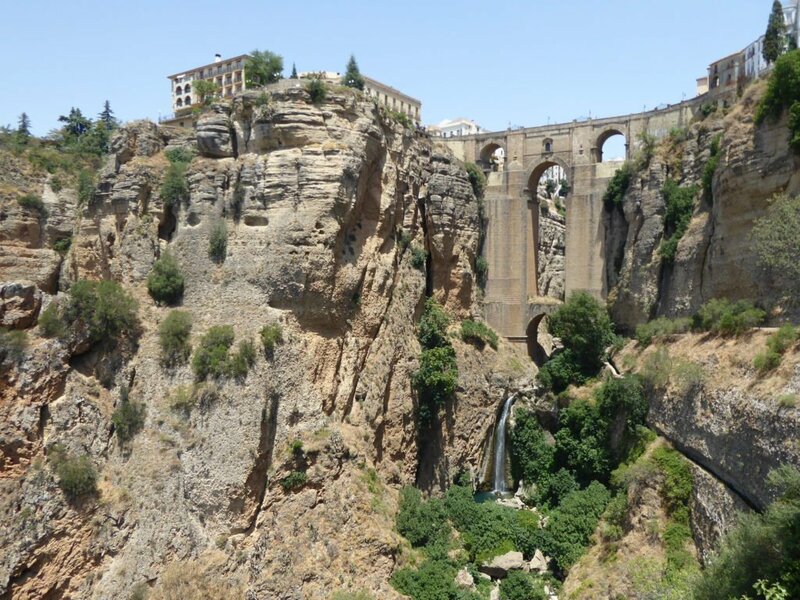 It is a dramatic piece of architecture and engineering as it spans across the El Tajo gorge, which drops even further down with a stream of rushing water and waterfalls of chillingly cool water and in most crystal clear. The colour of the bridge mimics these two plateaus as if sculpted out of the mountain only to leave the town precariously mounted on top with no escape but to ascent down sheer cliffs. 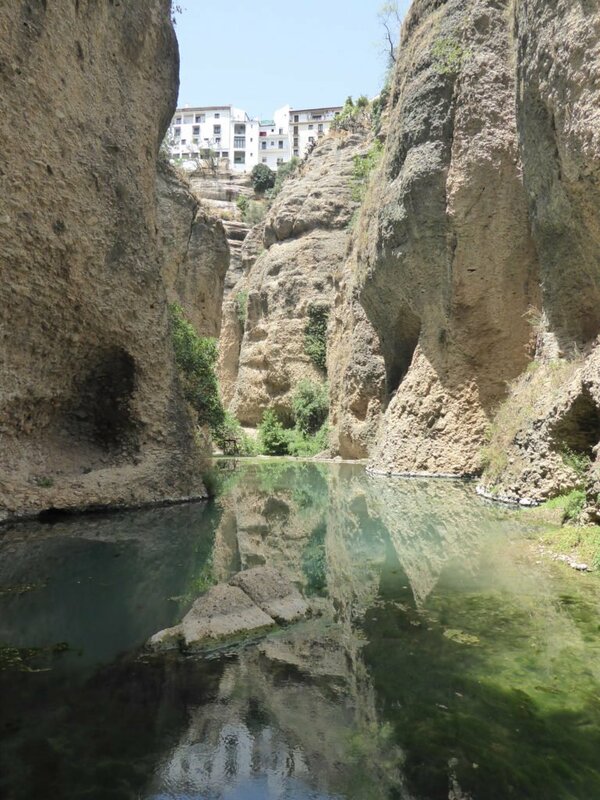 There are a few paths you can take down the El Tajo gorge with many picture-perfect views, but if you want to go for a swim then the hike down is quite a trip, the way up is a trek especially in 37 degrees – think of doing a stairmaster in the Sahara Desert ?! Worth it! The view of the bridge from below is impressive, a vast span reaching high to the arches looking immovable and imperial. 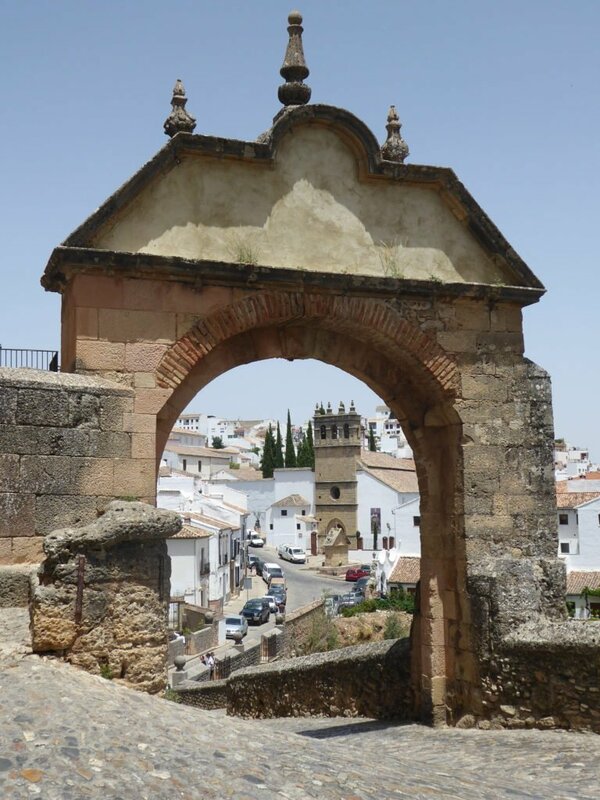 The history of Ronda goes back to the Neolithic times, but mostly from the 6th century BC with the current Ronda being established by the Romans, later in the 8th Century AD the Moors took over and that era ended in 1485, when it was conquered by the Marquis of Cádiz. So, with that in context the Puente Nuevo is a new bridge when you compare it to the other two bridges; they are not on the same scale and sometimes overshadowed by their huge neighbour but they are impressive due to age and their remarkable condition. The other two Puente Romano/Roman Bridge/Puente San Miguel and Puente Viejo/Old Bridge/Puente Árabe/Arab Bridge. The names of these two bridges are rather misguiding; in their current state they were constructed in the mid 1600’s, they got their names from being build where there used to be a Roman and Moor bridge, some of the original bridge can still be seen but only a small bit at the foundations protrudes from the gorge face. 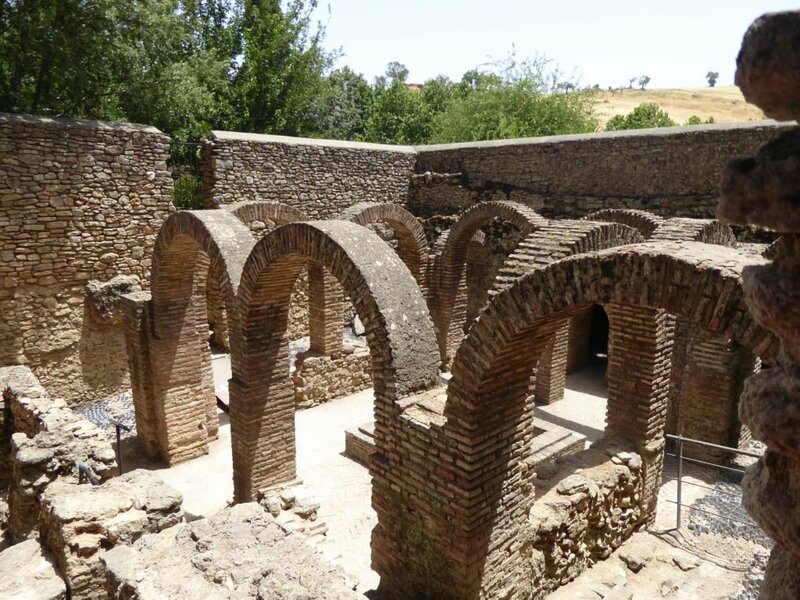 Right next to the Arab Bridge are the remains of some public Arab Bathes; learning and enhancing how Roman Baths were built, with and Islamic twist they were a sophisticated complex and a social gathering point for the men of the town. With constant running water, hot and cold rooms, hot and cold bathes with ablutions, sewerage and drainage constructed seamlessly into the building. 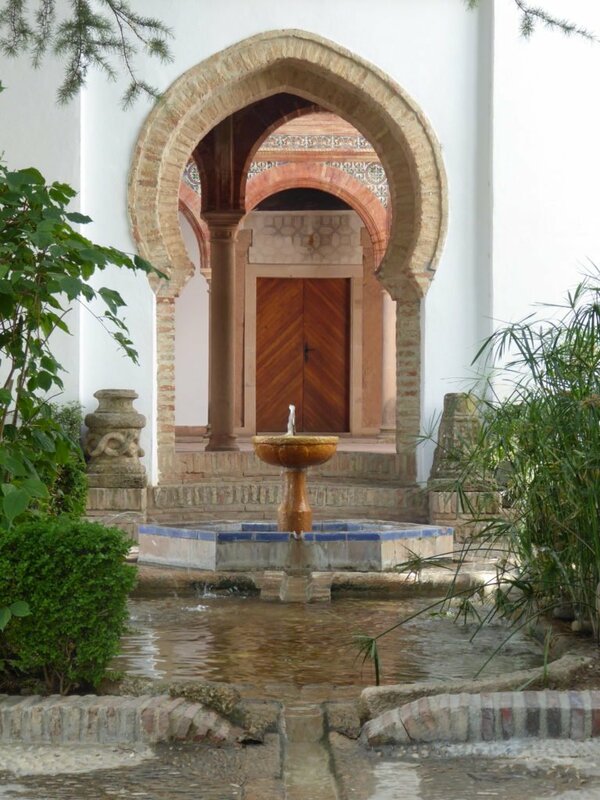 Stylistic with marble or tiled floors, beautiful arches and pillars and in its time painted walls with murals. 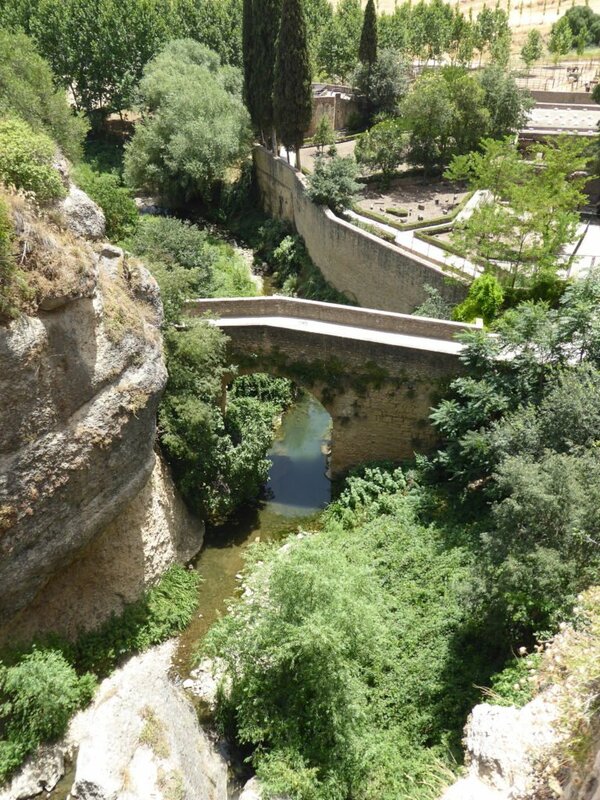 Nothing is far from each other in Ronda, from the baths you go up a hill through the Arco de Felipe/Felipe V Arch which was built in 1742 after the original Arab Gate collapsed, and up to Forestier’s hanging Gardens and The Secret Mine (part of an Arab Fortress built in the 14th Century. 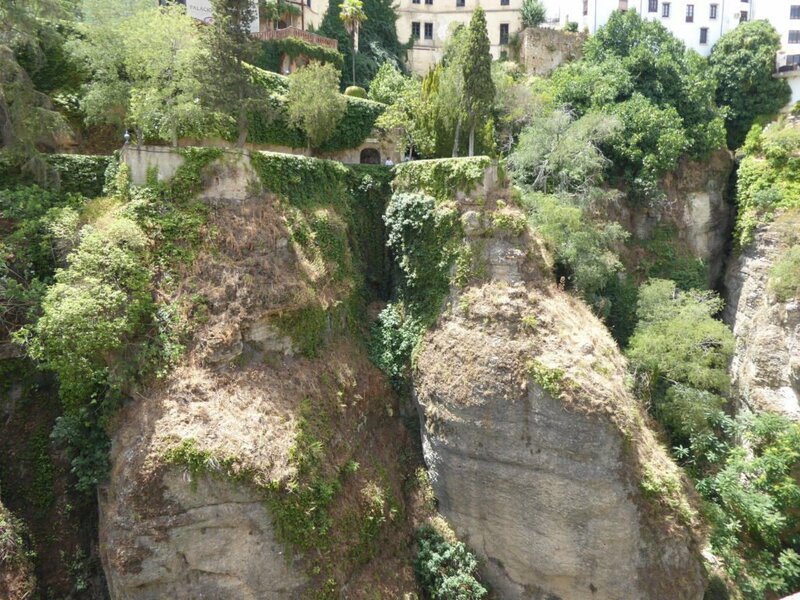 Although the gardens are lovely and flow naturally over balconies and manmade terraces you get a much better view and can appreciate them much more when viewed from the other side of the gorge which has plenty of viewing points and shows the true scale of the gardens. What I found most interesting was the fortress; a man made vertical cave 80 metres deep. Not just a vertical hole, a technically astute piece of engineering with a touch of flare! 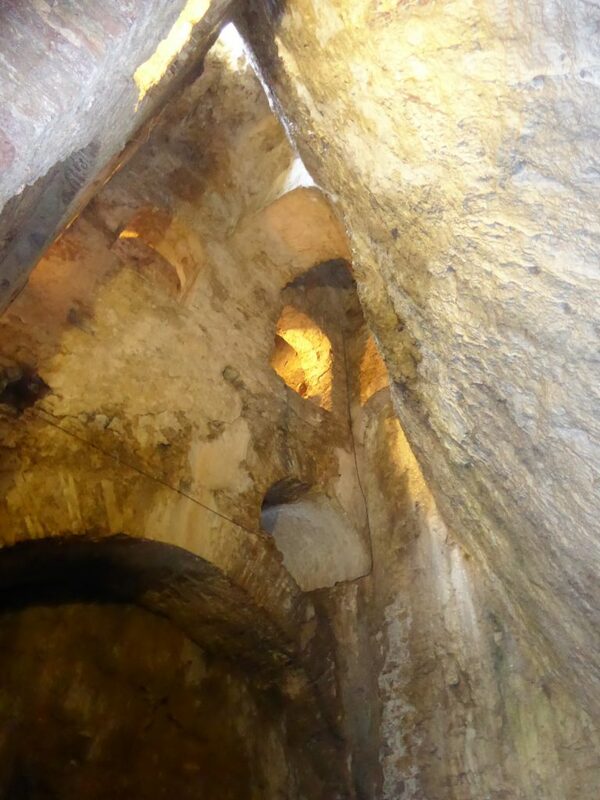 With overlapping vaulted ceilings cut into the rock the tool marks still clearly visible, passageways, rooms, and even a little hall with a ceiling that must be at least 8 metres high. As you go down the stairwell lit by looking widows cut through the cliff lighting the cave is a yellow orange hue giving it a sombre mood until you get to the bottom where you walk out into the blazing sun glistening of the crystal clear cool water. 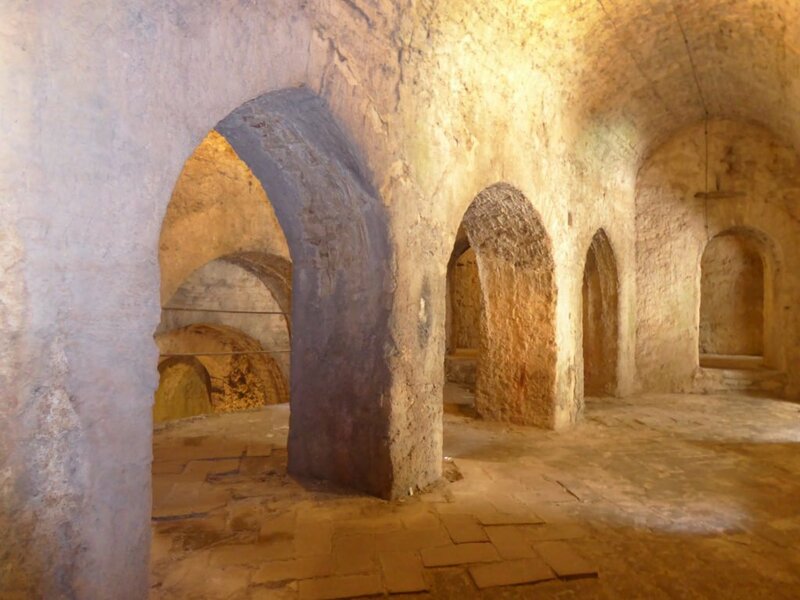 It was build as a functional fortress below a palace and houses military to defend the town, the water below also served as a perfect supply for the palace and was bucketed up by slaves. There is also a great little museum about Ronda going back to the Neolithic period all the way through to recent times in the Palace of Mondragon, which in itself used to be the palace of a Moorish King but it has been renovated and modernised so nothing much is left but still an interesting and informative museum of Ronda and its surroundings. Not too far from there is what used to be one of the main entranced to Ronda. 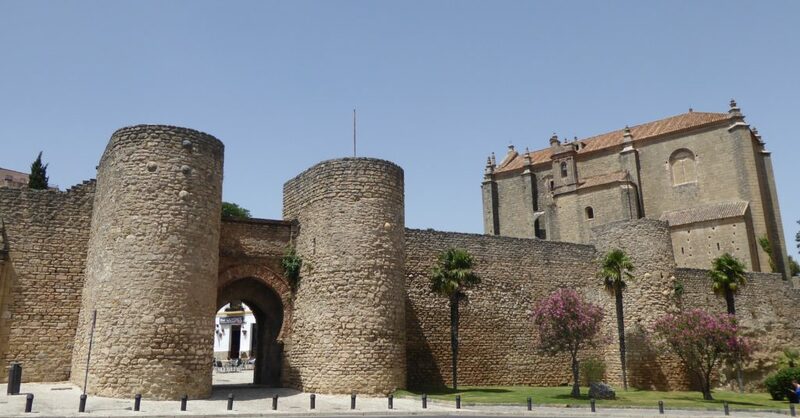 There is still quite a lot remaining of the wall that used to guard the city, some is better condition to other parts but the entrance still looks as fortifying as when it was built in the over a thousand years ago. I didn’t really know what else to do in Ronda, I could have easily just hiked around but didn’t feel like it, not in the boiling weather. I was told about a wine estate tours by Tannin Trail (www.tannintrail.com) and so happens to be run by a South African husband and wife, I like wine so let’s give it a go! As I don’t have a car transport is restricting but they pick you up from your hotel (truth be told they called me from reception and I was still in bed……..at 10:00, my bad! ), it was just me and a couple from the UK. Bodega Kieninger (www.bodegakieninger.com) – a little boutique wine estate, owned by an Austrian and run with the ethos of organic farming. No pesticides, no chemicals just letting nature do what it does best. 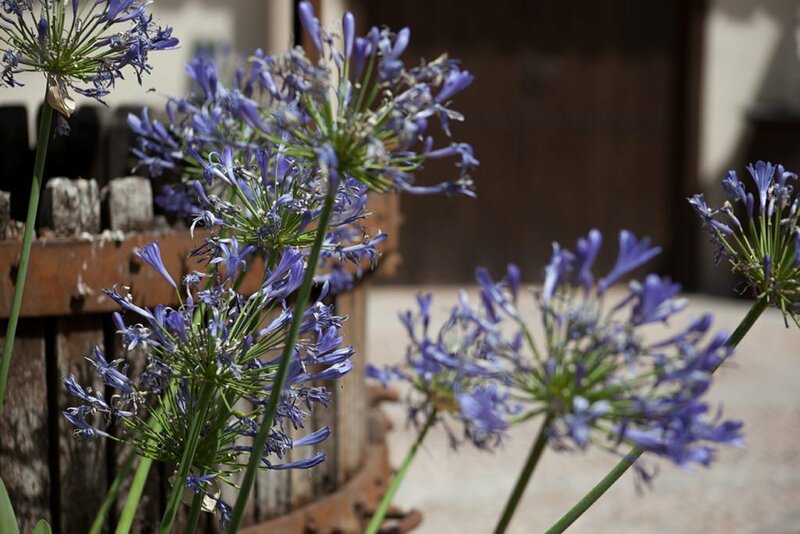 Where ever you walk you get a aromas from rosemary, lavender and all sorts of herds which they use to attract the natural predators of insects that could damage the vines and grapes. The owner wasn’t there so we were shown around by lovely lady who knew her stuff (especially considering she did the whole tour in English) and treated us like old friends, as it’s a boutique estate they don’t produce high volumes so their focus is on quality, a rose and two reds, and they have succeeded! 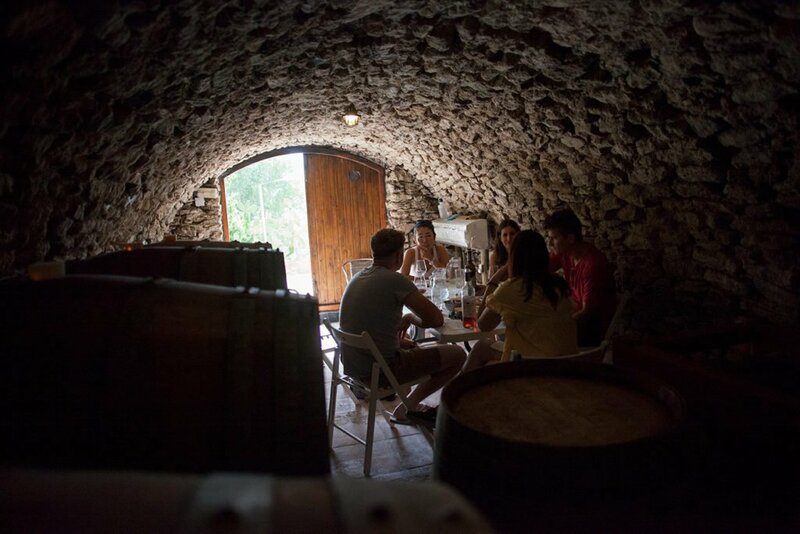 Bodega Joaquin Fernandez (www.bodegajf.es) – much bigger than the previous estate but still with a personal touch and run by a father and son, the latter took us on the tour, he certainly is very knowledgeable. They too run their farm with a strict organic process ethos, and we tasted a white (made from red grapes), a rose and two reds. I’m not a big fan of white but tasted delicious with a hard, creamy goats cheese I’d not eaten before, delicious, both of them. My favourite was their red made from Garnacha grapes, it’s the type of red I could drink regularly; lots of flavour, smooth on the palette and not residual chemical-alcohol bite. I bought a bottle. They also only produce a few thousand bottles a year. Bodegas MoroSanto (www.bodegasmorosanto.com) – bigger than the previous two and owned but an energetic gentleman with a passion for what they do. The tour was translated by Kelly from Tannin Trail, I’ve been to bigger estates but none of them usually give you such full access to their whole operation and there is no rush to their tour either. We had lunch there too, part of the package, but first we were enthusiastically given a Olive Oil tasting. 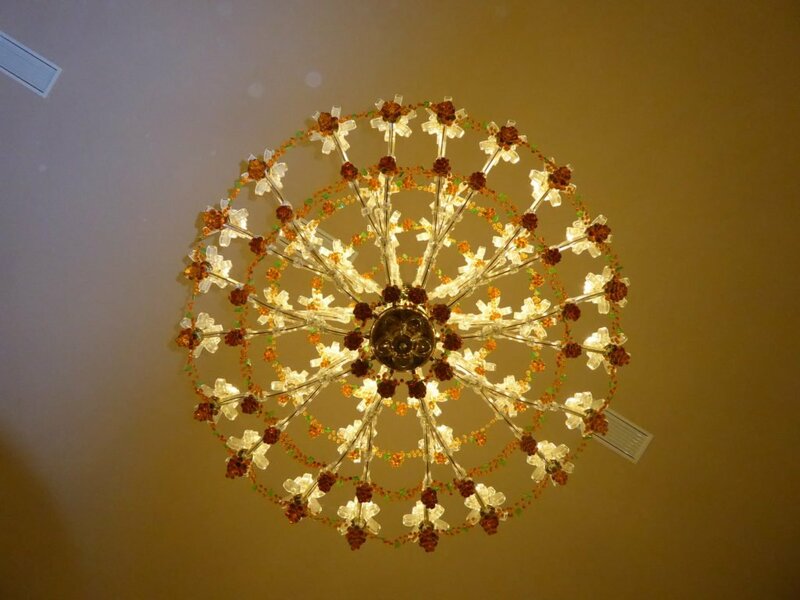 Now, it might seem odd to sip oil from a cherry glass but it was a brilliant experience and far from what I thought it would be like – I’ll go out of my way to do that again. 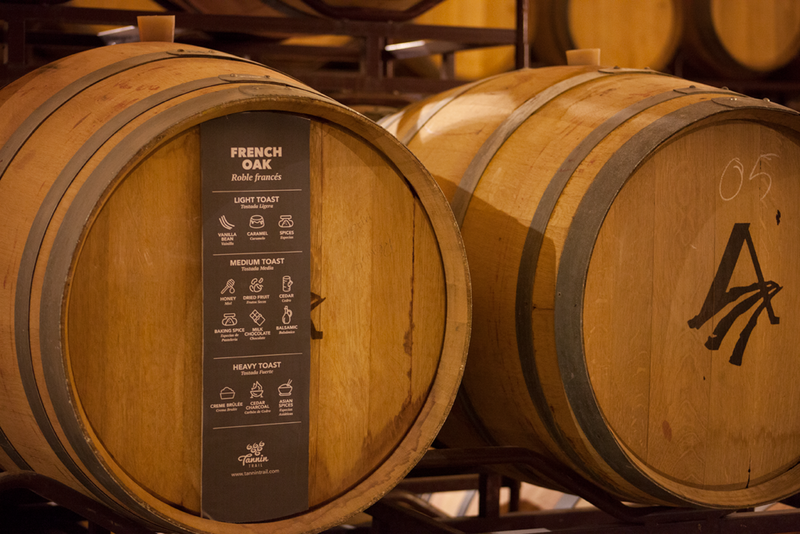 We only tasted two oils and with the guidance of the owner and one of the farmers we were shown how to warm it and taste it – the two oils each having their subtle difference just like wine. 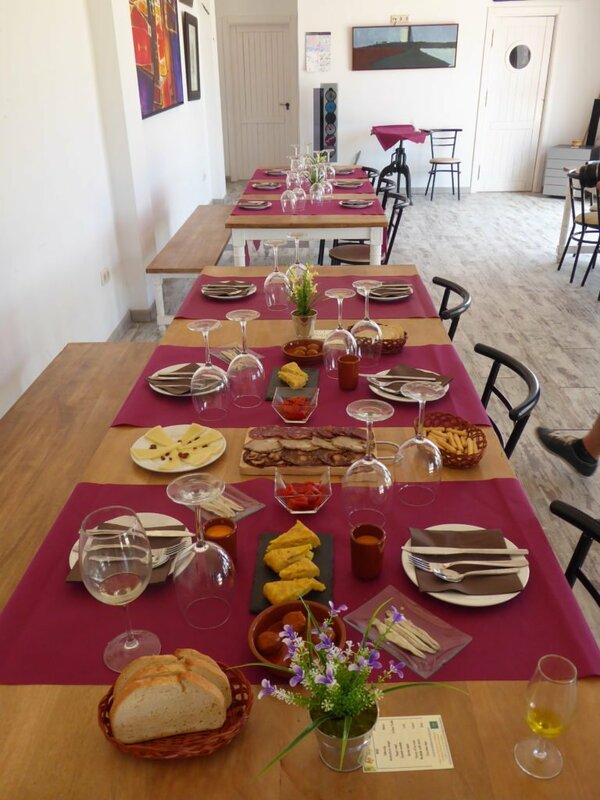 We tasted three reds and they went down a treat with the tapas served for lunch, a perfect way to the tour. Ronda and the region around has a lot more to offer than I thought, it really surprised me and I would really like to come back and explore further e.g. 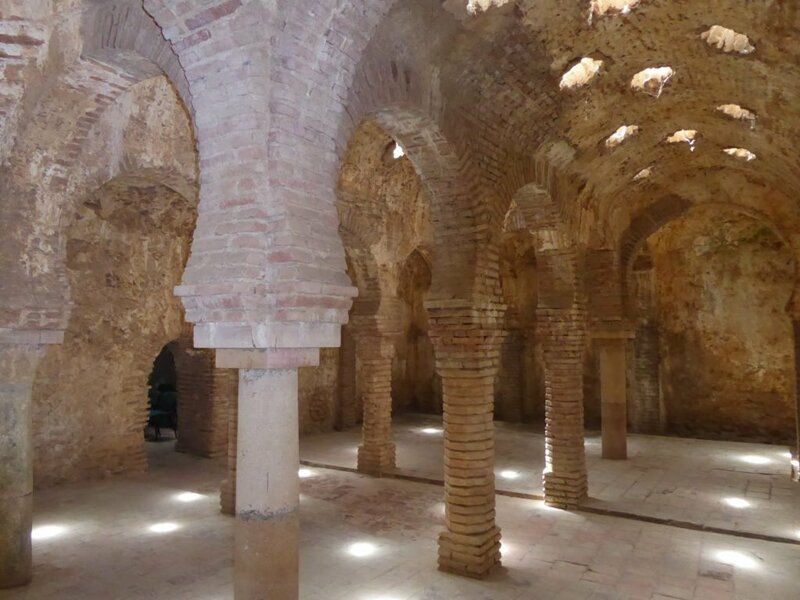 the prehistoric Cave of the Pileta with cave paintings, more of the wines, more of the food……..
Something a little quirky, right in the centre of the town is Convento de la Merced, a convent, where the nuns are not allowed to show their face to the public, catch is they sell freshly made produce like biscuits. Solution, there is a revolving door where you tell them what you want, put you money down, round goes the door and viola there come your biscuits! – that’s a shortened version. 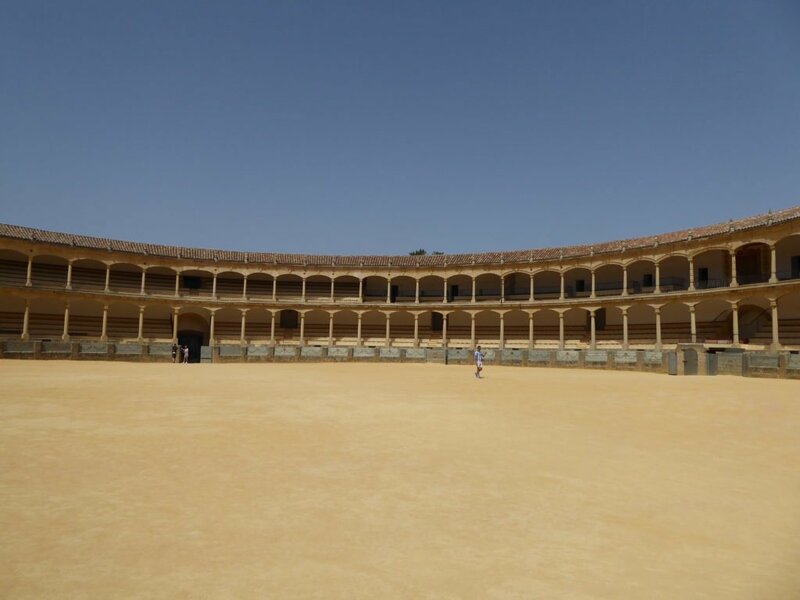 ….almost forgot Plaza de Toros/The Bullring, more of an in-depth tour compared to Seville; you get to see where they keep the horses and the history of them, the bulls going back over 250 years and the history of bullfighting. 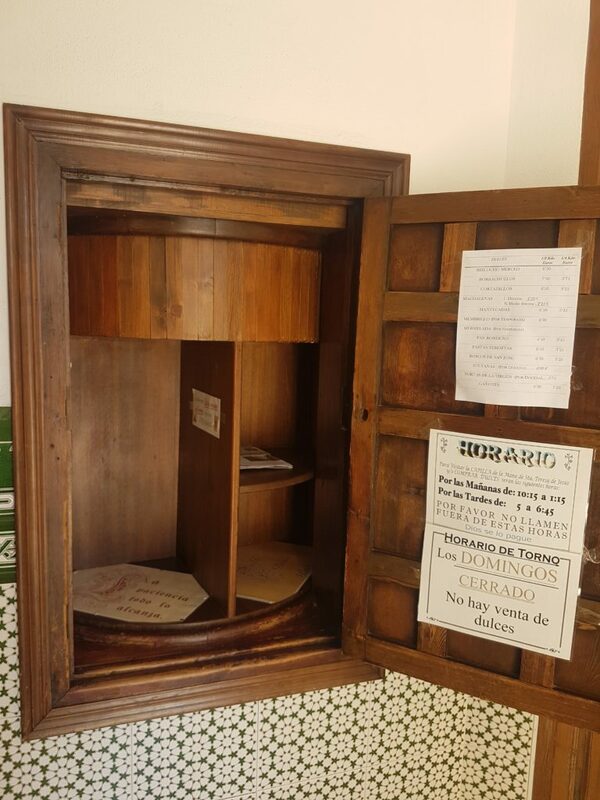 The little museum is not only about bullfighting but also some of the history of Ronda, I was especially impressed with their collection of duelling pistols and some funny, and serious, stories about duelling. 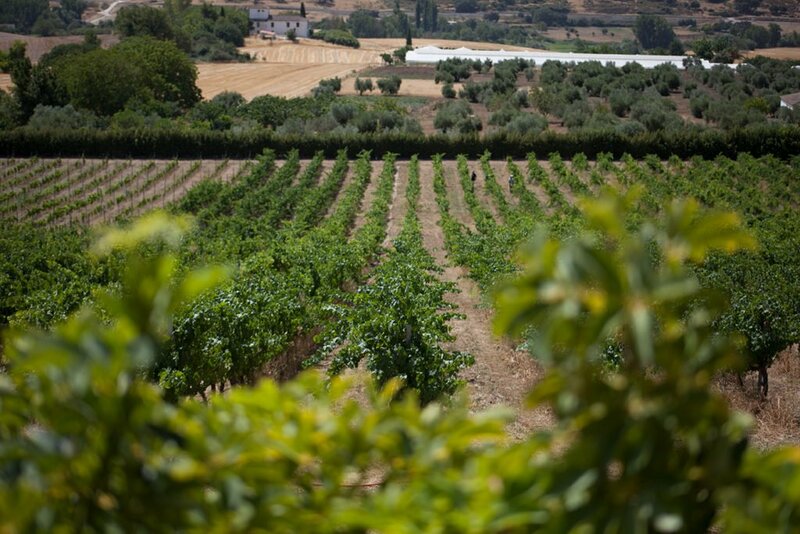 The wine estates were a fabulous addition to my time in Ronda, here are a few additional pics. I think I love Ronda!